Ha ha ha.....and I bet you thought I was talking about MY baby didn't you!? A bit early for my little one. No, I am talking about one of the mum's at Mr O's previous school who had a baby boy last Monday. Congratulations Natalie & Lou. I got my inspiration from Splitcoast Stampers. I don't use buttons very often and I have no good reason why! LOL. I really should. Do you use buttons on your projects? 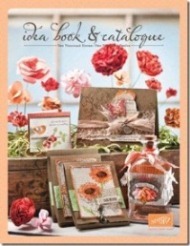 The stamp set I've used is "A Slice Of Life", the level 1 hostess set from the Autumn/Winter Mini Catalogue. 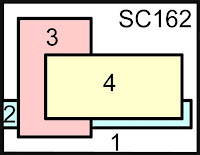 The sentiment is the level 1 hostess set from the IB&C. I finally completed Emily's christening invitation this week and here it is. 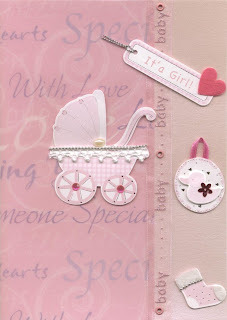 I decided to go pink and white and got the tag card idea from Nicole Heady. It was so elegant and I loved the idea straight away and knew I was going to use it for the invitations. As I needed to make 'a few' of them, this was also a quick and easy project. Here is a better view of the tag card. Oh, I had 3 tag cards left and would you believe that I ran out of Pretty In Pink Taffeta Ribbon!! Ohhhh Noooooooo. Luckily, a fellow demonstrator Tracey, lives not far away and I was able to get some from her. You are probably thinking, just buy some more.......my problem was that I was sending them the following day and delivery takes a few days. I printed the front and the inside of the card on my computer in Pretty In Pink. It took me a couple of goes to get it right, but once I had the template right, it was just a matter of feeding the card stock into the printer and viola! I was really pleased with how the invitations turned out and I've had some lovely comments by those that have received them (mostly family so they are biased anyway!! ROFLOL). Yes, I made a nappy cake for Neill & Kath. I CASED the idea from Susan but mine has not turned out as nice as hers! For starters, I have folded the nappies the wrong way (should be inside out so they are white). As you can see, the outside of the nappy have colour on them. I couldn't be bothered unrolling them but I now wish I had! (lesson learned). Susan's cake is much bigger (it has 3 tiers) but as this was my fist attempt, I only bought 1 pack of nappies and there is a bottle of gripe water in the middle. I may add some other little bits as it still looks like something is missing. This is the top view with the lovely big bow I bought. I have another friend who's baby is due soon so I may have to do another cake (pink, as she is having a girl). I have been into central London today to the Australian High Commission as I need to replace my NSW driver's license in readyness for my return (our move) back to Australia. Can you believe that I can change my maiden name to my married name on my passport with just our marriage certificate but I need a specific certificate from Births, Deaths & Marriages (in NSW) to be able to change my name on my driver's license !!! How bizzare is that. 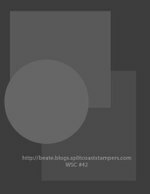 Here is todays sketch on Splitcoast Stampers (SCS). If you haven't already looked at SCS, please do. You can brouse the resource area for tutorials on just about anything you can think of or have a look at the gallery for inspiration. The people there are very friendly too. 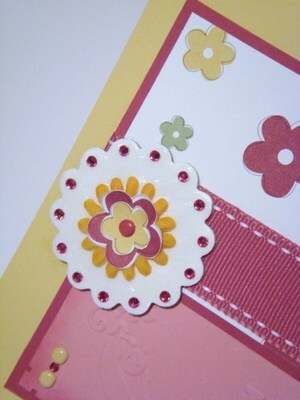 I am also using this card for Tuesday's Colour Combination on SCS which is to use Real Red, Apricot Appeal & Ballet Blue. I don't have any DP in similar colours so I used my Cuttlebug Bloom Dots embossing folder on the Apricot Appeal cardstock and added some red gems. Stamps: SU! - Wild About You. Ink: SU! - Ballet Blue, Versamark. Paper: SU! - Ballet Blue, Apricot Appeal, Real Red, Whisper White. 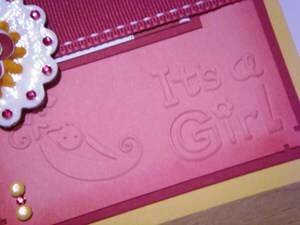 Accessories: Red Gems, Red Grosgrain Ribbon, Googly Eyes (love these), Photo Corner Punch. My cousin Rodney was killed in a motor bike accident earlier this year - he absolutely loved his bikes. As sad as this was, his daughter Natarsha fell pregnant - the start of a new life began ! Natarsha had a baby girl, Zara. It is very sad that Rodney will not see his grand daughter but I bet he is watching over her. This is the card I made for the happy occasion. I CASED this card from my friend Karen. I changed a few things but I really liked the colour scheme. Here is a view of the lion and bird that I raised with 3d foam. I just had to take a close up photo of the lion..
Stamps: SU! (Wild About You, Riveting) G Studio Clear Stamps, Hero Arts (Polka Dot Pattern.. Ink: SU! (Pretty In Pink, Certainly Celery, Bashful Blue, Close to Cocoa, Barely Banana), Versamark. Paper: SU! (Pretty In Pink, Pale Plum, Sage Shadow, Barely Banana). Accessories: Pink Satin Ribbon, Pink Gem Stones, Pink Square Brads. I had to quickly whip up this baby girl card for Karen as I couldn't really use the blue card (I will save it for another baby boy). I also cut a magnetic strip and placed in on the back so Karen could put it on the fridge. Supplies: Stamps: SU! Bundle of Joy, Wash DayJumbo Wheel, Hero Arts (It's a Girl). Ink: Pink Passion, Cartain Celery. Paper: SU! Pretty in Pink, Certain Celery, Blush Blossom. Accessories: Pale Pink ribbon from local craft shop. 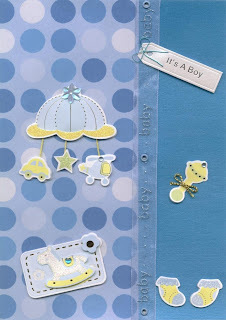 I made this boy card a couple of weeks ago while in Australia for my friend Karen as we thought she was having a boy - no, she had a girl ! Supplies: Stamps: SU! Bundle of Joy, SU! Riveting. Ink: SU! Chocolate Chip, Bashful Blue. Paper: SU! Bashful Blue, Barely Banana, Certainly Clelery. 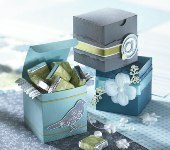 Accessories: Pale Blue ribbon from local craft shop. 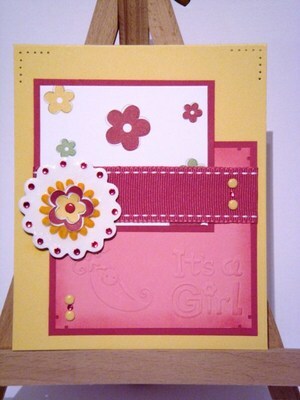 Our next door neighbour's daughter had a baby girl and this is the card I gave her. My friend Kell has had a baby boy.